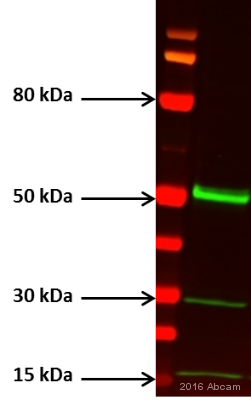 Rabbit polyclonal RAGE antibody. 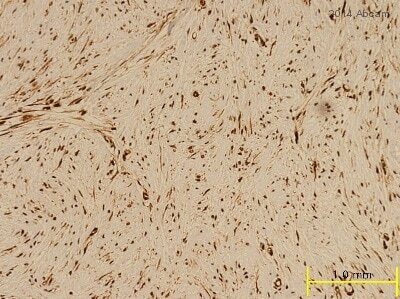 Validated in WB, IHC, Flow Cyt, ICC/IF and tested in Mouse, Rat, Human. Cited in 53 publication(s). Independently reviewed in 14 review(s). 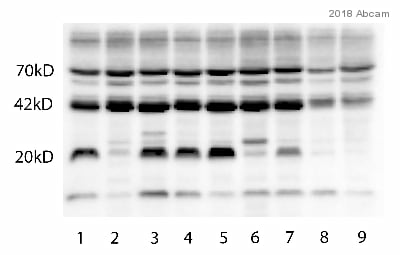 By Western blot, this antibody detects two bands in the 45 kDa range representing the RAGE protein pre and post glycosylation in Mouse lung extract. 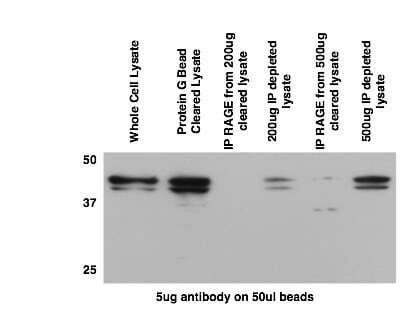 This antibody also detects an ~25 kDa protein that is believed to be proteolytic degradation product. Immunohistochemical staining of RAGE in transgenic Mouse retina results in staining of the retinal pigmented epithelium and photo receptor cell layers. Synthetic peptide corresponding to Rat RAGE aa 362-380. Our Abpromise guarantee covers the use of ab3611 in the following tested applications. IHC-Fr Use a concentration of 1 - 2 µg/ml. WB Use a concentration of 1 µg/ml. Detects a band of approximately 45 kDa (predicted molecular weight: 42.6 kDa).Can be blocked with Rat RAGE peptide (ab41778). Mediates interactions of advanced glycosylation end products (AGE). These are nonenzymatically glycosylated proteins which accumulate in vascular tissue in aging and at an accelerated rate in diabetes. Acts as a mediator of both acute and chronic vascular inflammation in conditions such as atherosclerosis and in particular as a complication of diabetes. AGE/RAGE signaling plays an important role in regulating the production/expression of TNF-alpha, oxidative stress, and endothelial dysfunction in type 2 diabetes. Interaction with S100A12 on endothelium, mononuclear phagocytes, and lymphocytes triggers cellular activation, with generation of key proinflammatory mediators. Interaction with S100B after myocardial infarction may play a role in myocyte apoptosis by activating ERK1/2 and p53/TP53 signaling (By similarity). Receptor for amyloid beta peptide. Contributes to the translocation of amyloid-beta peptide (ABPP) across the cell membrane from the extracellular to the intracellular space in cortical neurons. 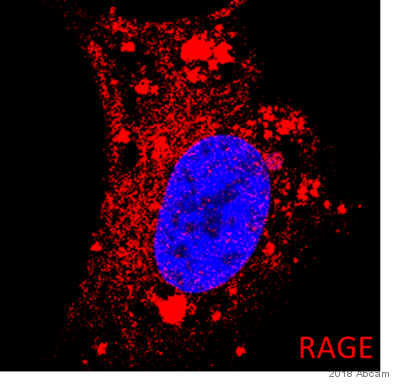 ABPP-initiated RAGE signaling, especially stimulation of p38 mitogen-activated protein kinase (MAPK), has the capacity to drive a transport system delivering ABPP as a complex with RAGE to the intraneuronal space. 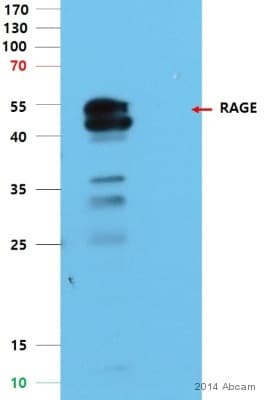 ab3611 at a 2µg/ml concentration staining ~ 45 kDa RAGE in mouse lung lysate by Western blot (ECL).This antibody detects two bands in the 45 kDa range representing the RAGE protein pre and post-glycosylation in mouse lung extract. This antibody also detects an ~25 kDa protein that is believed to be proteolytic degradation product. Immunohistochemistry was performed on normal biopsies of deparaffinized Mouse lymph node tissue . To expose target proteins heat induced antigen retrieval was performed using 10mM sodium citrate (pH6.0) buffer microwaved for 8-15 minutes. Following antigen retrieval tissues were blocked in 3% BSA-PBS for 30 minutes at room temperature. Tissues were then probed at a dilution of 1:20 with a rabbit polyclonal antibody recognizing RAGE ab3611 or without primary antibody (negative control) overnight at 4°C in a humidified chamber. Tissues were washed extensively with PBST and endogenous peroxidase activity was quenched with a peroxidase suppressor. Detection was performed using a biotin-conjugated secondary antibody and SA-HRP followed by colorimetric detection using DAB. Tissues were counterstained with hematoxylin and prepped for mounting. 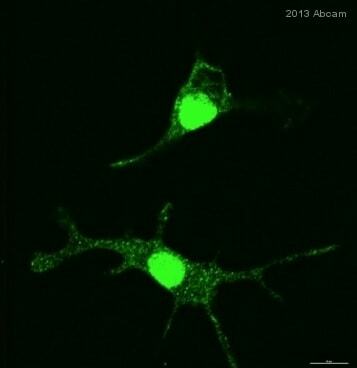 ab3611 at 1/200 staining mouse BV2 cells by ICC/IF. The cells were formaldehyde fixed, permeabilized and blocked with serum before incubation with the antibody for 1 hour. 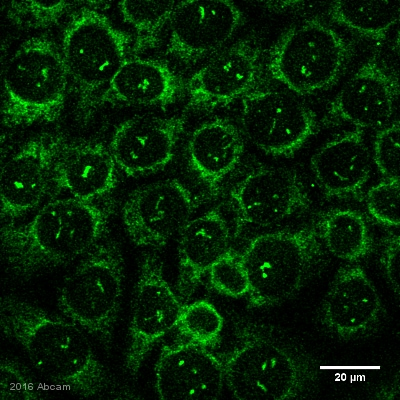 An Alexa Fluor ® 488 conjugated goat anti-rabbit antibody was used as the secondary. The left hand panel shows unstimulated cells, the right hand panel LPS stimulated cells. Immunohistochemistry was performed on normal biopsies of deparaffinized Mouse heart tissue. To expose target proteins heat induced antigen retrieval was performed using 10mM sodium citrate (pH6.0) buffer microwaved for 8-15 minutes. Following antigen retrieval tissues were blocked in 3% BSA-PBS for 30 minutes at room temperature. Tissues were then probed at a dilution of 1:20 with a rabbit polyclonal antibody recognizing RAGE ab3611 or without primary antibody (negative control) overnight at 4°C in a humidified chamber. Tissues were washed extensively with PBST and endogenous peroxidase activity was quenched with a peroxidase suppressor. Detection was performed using a biotin-conjugated secondary antibody and SA-HRP followed by colorimetric detection using DAB. Tissues were counterstained with hematoxylin and prepped for mounting. Ab3611 used in IHC (frozen) in transgenic mouse retinas. Immunohistochemistry was performed on normal biopsies of deparaffinized Mouse kidney tissue. To expose target proteins heat induced antigen retrieval was performed using 10mM sodium citrate (pH6.0) buffer microwaved for 8-15 minutes. Following antigen retrieval tissues were blocked in 3% BSA-PBS for 30 minutes at room temperature. Tissues were then probed at a dilution of 1:20 with a rabbit polyclonal antibody recognizing RAGE ab3611 or without primary antibody (negative control) overnight at 4°C in a humidified chamber. Tissues were washed extensively with PBST and endogenous peroxidase activity was quenched with a peroxidase suppressor. Detection was performed using a biotin-conjugated secondary antibody and SA-HRP followed by colorimetric detection using DAB. Tissues were counterstained with hematoxylin and prepped for mounting. Publishing research using ab3611? Please let us know so that we can cite the reference in this datasheet.